Korea’s tallest skyscraper is a double-edged sword for its owner, as the building could either become a landmark that adds value or end up being a costly, low-liquidity asset. South Korea’s fifth-largest conglomerate Lotte Group has bet on its building becoming a landmark. Lotte World Tower, which came about from a long-held dream of Lotte Group founder Shin Kyuk-ho, was completed in December 2016, after yearslong disputes over its height, safety and profitability, just to name a few. The tower was the last piece of the group’s blueprint to build an extensive commercial complex. Backed by Lotte Department Store, Lotte Hotel World and the Lotte World amusement park in the vicinity of Jamsil, southern Seoul, the streamlined building has become a defining feature of the skyline in eastern Seoul. With 123 floors, the 555-meter building is the fifth-highest in the world and the tallest in the country -- at least until Hyundai Motor Group completes its Global Business Center in Samseong-dong. The upcoming 105-story building, set to be completed by 2023, will measure 569 meters tall. Occupying Lotte World Tower’s total floor area of 123,678 square meters are commercial facilities including a shopping mall, a duty-free shop, residences, a six-star hotel and an observation deck. The deck, named Seoul Sky, occupies the 117th to 123rd floors, with a glass floor offering a bird’s-eye view of the city. As of March this year, it had attracted 1.65 million local and foreign visitors, according to official figures. In addition, the duty-free business saw 1 trillion won ($881 million) in profits as of December last year, up from 570 billion won the previous year. However, the retail conglomerate has faced challenges with the tower. A major issue with the construction of the high-rise had been that it might obstruct air force planes that take off and land at the nearby Seoul Air Base. The Lee Myung-bak government eventually granted a construction license to the building after lifting the conventional height restriction and deciding to shift the degree of one of the runways by three degrees. The move triggered speculation of alleged collusion between the conglomerate and Lee, who had previously worked in the construction industry. The Board of Audit and Inspection announced in February this year that there had been no collusion. Furthermore, concerns about safety plagued the group throughout the construction period. In February 2013, cracks were detected in key pillars of the building and another crack was found the following year on the ceiling. A fire even broke out on the 47th floor in 2015. Another burden for the builder was money. The mega-sized construction officially cost about 4 trillion won, but considering other costs, the actual financial input was likely much higher. An example of additional expenditure was the fine imposed on the group for occupying main roads during the tower’s construction. In January, the Supreme Court upheld the Songpa District Office’s earlier action of handing down a 6.4 billion won fine to operator Lotte Property & Development. 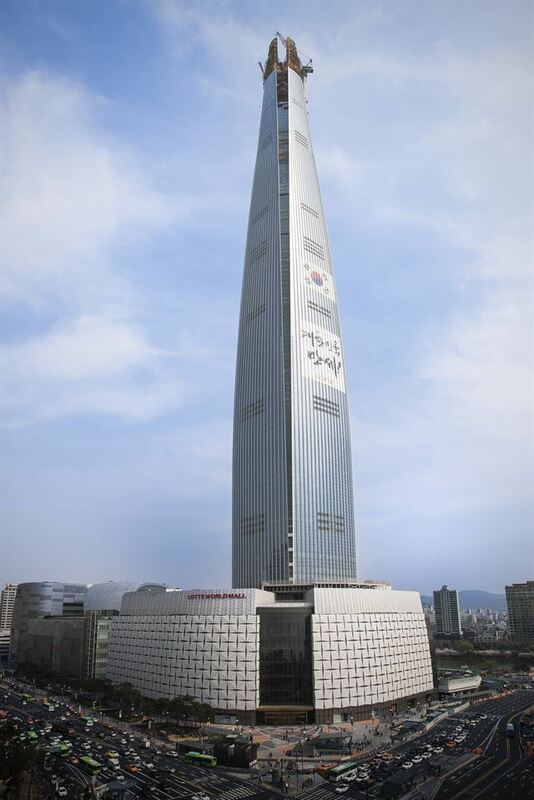 Meanwhile, the market price of the building is estimated at around 1.13 trillion won, but the exact value remains uncertain as Lotte World Tower, built and operated by the group, has never been put up for sale. To make up for deficits and maintenance costs, the conglomerate has been working to attract new tenants. The vacancy rate of the building stood at 33.4 percent in February, down from 46 percent in January and 55 percent in August last year, though experts note the figure is still higher than the recommended 10 percent range. The recent improvement in the vacancy rate can be partly attributable to Workflex, a premium office-sharing business launched by the conglomerate in March. A reason behind the building’s low tenant density could be its high rental fees, which are about twice that of Samsung SDS Tower in the Jamsil vicinity and similar to that of Gran Seoul in Jongno, central Seoul. Except for a few global companies, such as Japanese sportswear brand Descente, a majority of the tenants are Lotte Group affiliates, such as Lotte Shopping, Lotte Chemicals and Lotte Property & Development. Despite the challenges, the skyscraper has built up a reputation as one of Seoul’s most frequently visited tourist spots as well as a symbol of the country’s economic advancement. 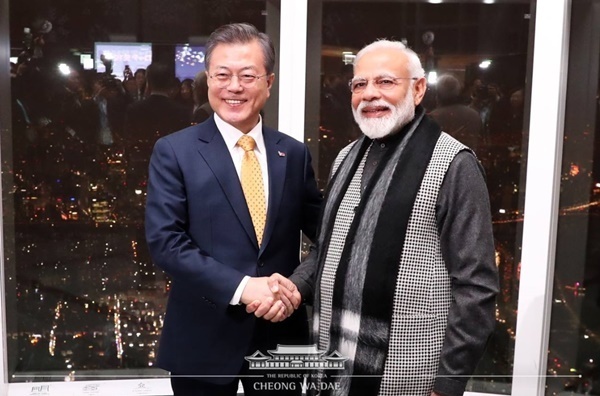 President Moon Jae-in held a summit dinner there with his Indian counterpart Narendra Modi during the latter’s state visit in February. In addition, Lotte World Tower’s observation deck, shopping arcade and aquarium often appear on TV entertainment shows.